Correct, they stopped running the 4th train when the dual station layout was done away with. Unless they utilize both queue sections in the station, a 4th train would not speed up loading/wait time. 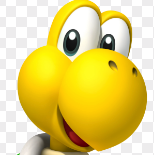 If memory serves, the train colors are Orange, Green, Dark Blue, and a lighter Blue/Teal. 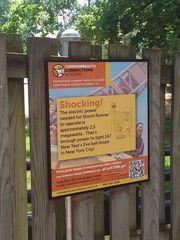 Shockwave was my first experience with a stand up coaster so I'm a little sad to see it go. That being said it will be interesting to see what they'll decide to do with that vacated space. Nice report! I enjoy the creativity with the theming here and the vibrancy with the water park rides. Especially liked the on ride viewpoint in the photo from the log flume showcasing the uniquely colored water! SP parking lots are a nice incentive, I'm sure getting to the lot itself becomes a lot easier when the layout is more familiar too. The bags didn't cause too much of a problem on the rides with shorter lines (GADV tends to have longer lines, which segued to my comment about feeling averse to bags on the rides) and many coasters, especially the wooden ones, had very efficient dispatch rates. 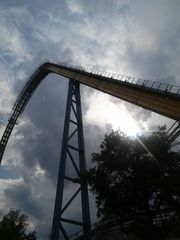 The only ones that took a while for me were Fahrenheit and Skyrush. To be fair, for whatever reason the Skyrush train before mine had to be re-locked 3 different times in the middle of restraint check, so I can understand why there would be some hesitation on the part of the ride ops when something like that occurs. It seemed fairly quick during the early parts of the line on the lower level. I'd like to try the park on a weekday if it's manageable for me to get down there to be able to experience more of what they have to offer, as there really is a lot! Thanks! 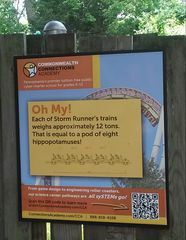 I definitely agree with the take on capacities and single rider lines. 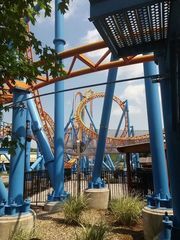 While I was in line for Fahrenheit I saw several trains dispatch with 10 riders (two rows of singles), which for a ride that only accommodates 12 at a time significantly increases the wait time if it occurs frequently. I liked the concept of Roller Soaker and while the chance to ride it would have been nice I can see how the issue of slow moving lines would be partial grounds for its removal in favor of something that can take a larger amount of people per hour. The crowd wasn't uncomfortable by any means for a Saturday but if the population I saw was the norm for weekend operations some more high capacity rides really would go a long way. 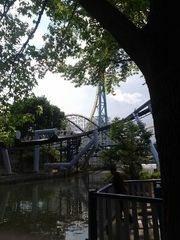 Having not been to Hersheypark since I was 5, it was nice to get an opportunity to go there again a few weekends ago. I visited the park on May 30th, coincidentally the anniversary of the day the park opened in 1906 as I later discovered. The ride in was a bit sluggish, with about a 45 minute duration between paying for parking and actually getting to the parking lot. I believe they also had a couple of concerts or other events going on that day both in the park and in the nearby Giant arena which would explain the large amount of people trying to get in. 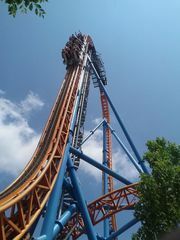 We finally got to the park gates around 11 and headed straight for Fahrenheit. Being a big fan of Intamin coasters it was a ride that had intrigued me for quite some time. The line didn't seem very long but between the low capacity (6 rows of 2), slow load times and reserved seating for fast lane riders it took nearly an hour to get on the ride. 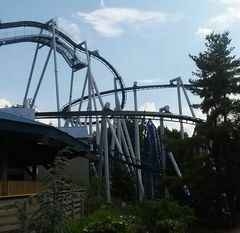 It was smooth and unique with the 90 degree lift hill and the multiple helix turns made for a lot of intensity after the initial drop, which in itself was a cool experience. Several interwoven loops. The lift and drop. Some impressive crests near the middle of the ride! As a side note, this ride as well as a few others really made me appreciate Great Adventure's no bag policy. While it's nice to be able to carry everything around it really did delay load times here with everyone scrambling to put away or retrieve their things. The people checking restraints also seemed a bit lackadaisical as compared to the ones at Great Adventure, who routinely move very quickly and finish checking restraints before the second train arrives back at the station. I did appreciate that the operations between the two parks are different though, and overall it didn't bother me too much. After a short preview of the waterpark area we found the Lightning Racer, a dual track racing coaster not too different from Rolling Thunder. Unlike Fahrenheit before it this one had no line and I got to ride both sides without waiting at all. 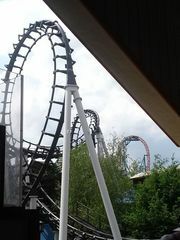 It stacked up well against the newer model steel coasters and gave a good ride. I really liked the ending where the "Winning" coaster was signaled with a flashing light at the finishing line. 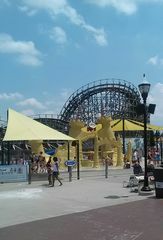 A small portion of the waterpark with Lightning Racer in the background. The new Laff Track ride was next on the agenda considering the layout of the park... Or at least it would have been, had the line not been excessively long. Since this was only a one day trip, I opted for the nearby Wild Cat, with a much more manageable 10 minute line. It was a bit bumpy being one of the older rides in the park but I enjoyed it nonetheless. The Wild Cat. A Lamp! And The Wild Cat. Next up was Storm Runner, another Intamin ride in the same vein as Kingda Ka. It went from 0-72 MPH in 2 seconds compared to Ka's 0-128 in 3.5, but had some additional track elements and twists on the way back to the station. A long wait, but definitely worth it. Some cool facts about the Storm Runner. Unfortunately the nearby Sidewinder was closed for maintenance. It tested but didn't take any riders. After a surprisingly tasty pulled pork lunch we headed for Great Bear. 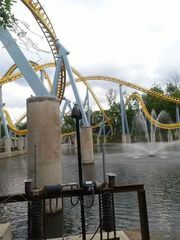 This one was a looping inverted coaster that wound above the nearby lake. 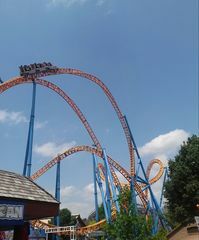 It was a great ride and I enjoyed the spiral at the beginning rather than the typical immediate drop from the lift. The big drop coming later in made it that much more exciting. A little bit of the Great Bear. 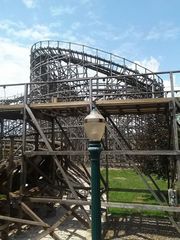 A more substantial view of the Great Bear. After the Great Bear came the SooperDooperLooper. This mouthful of a name coaster was one of the older models in the park and it showed- my train got stuck on the chain lift over the lake! Luckily an operator came up quickly to ensure that everyone was comfortable and ensured that maintenance wouldn't take long. The ride was operating within the next 15 minutes with no manual ejection necessary, which was fortunate because I reckon I got the last ride of the day on there. 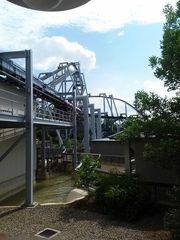 Each time I passed the coaster afterward, it was closed. A bit of the Looper and its friends, with some foreshadowing for the next roller coaster in line. 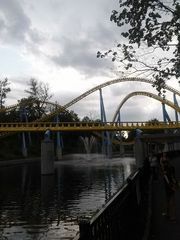 The aptly named Skyrush would be the next and last coaster of the day. What a rush it was! The design reminded me of a B&M Hyper similar to our own Nitro but it was yet another Intamin design. The restraints were a nice OTSR-Lap Bar hybrid and the train had a different design than is typical with the middle two seats oriented closer to the front and the side seats farther back with no floor underneath them. I opted for an edge seat to get the floorless experience. The wait time was extended by a good 20 minutes for the front row but it was worth the wait. After an incredibly fast climb to the top of the hill this one never let up and provided insane airtime that literally kept me on the edge of my seat (even off it at times!) for the entire ride. That awesome first climb with the sun still attempting to break through the clouds. 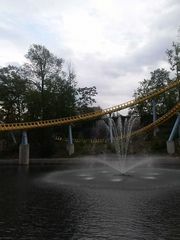 The track weaves through a water filled area with fountains. An ending waterfall with more track in the background! At this point it began to storm and we opted to beat the crowds before another 45 minutes of parking lot waiting would be necessary. Concert goers were streaming in at this point so it was good to avoid the pandemonium and free up a parking spot for someone who needed it. This meant that a number of flat rides that I was looking forward to would have to be done next time, but I can confidently say that there will be a next time based on this experience. Hershey is a very well maintained, beautiful park with plenty of good rides to be had. Thanks for sharing the link! I'm a sucker for stuff like this. It's always nice to be able to apply the knowledge you've gained in classes to something you love. Batman vs. Superman themed dueling coasters is an intriguing idea and would fit perfectly with the park's emphasis on both Superheroes. In close proximity to the Justice League store as well, it just seems right. Happy to see Zumanjaro return to operation and a smooth opening for Hurricane Harbor. Also glad that the fire doesn't seem to have caused any major damage and was put out quickly. Nice touch on the BTR sign photo as well! Glad you enjoyed it! Been to Camel a few times in both the summer and winter seasons, definitely a nice park with gorgeous mountain scenery and as you mentioned the heated water is a nice touch. Triple Venom really does tend to rough you up, to the point where I've never done all 3 in one visit. Vortex and Spin Cycle are some of the best on offer in my opinion and that type of slide is certainly something you don't see every day. I haven't visited Action Park but it's always intrigued me. I'll have to make the drive down there sometime. Individual lines for the Buccaneer ends and middle are an excellent addition! Not only do they make the line smoother if you want to ride quickly but they also remove an element of randomness when you're looking to ride in a particular way. Hoping Zumanjaro re-opens soon as well, hopefully an attendant being present near the entrance is a sign that it's been getting attention and will be up and running in the coming weeks. 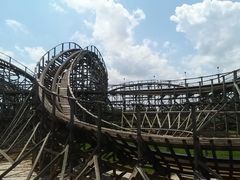 Glad to hear that El Toro got both trains on the track as well. PTR 5/15/15 Quick pre-opening walkthru. Really like the unique angles on a lot of these pics! Plenty of good material from portions of the park that are off the beaten path. It didn't take long for more work on El Diablo either. The flames on the bottom ends of the signboard are a notable addition.